WOO HOO! 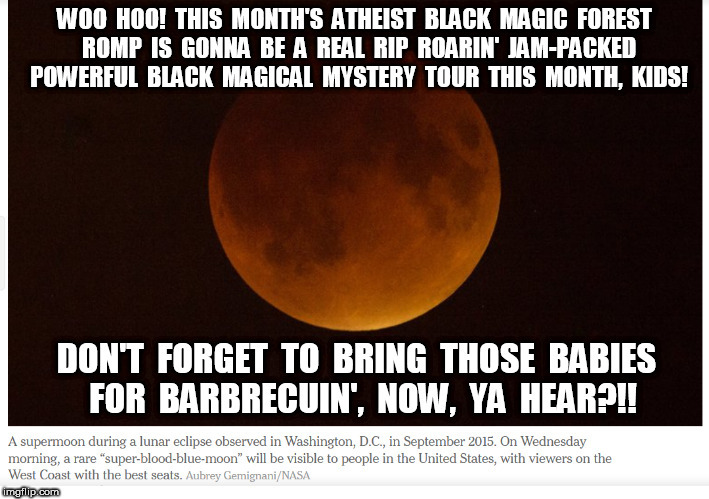 THIS MONTH'S ATHEIST BLACK MAGIC FOREST ROMP IS GONNA BE A REAL RIP ROARIN' JAM-PACKED POWERFUL BLACK MAGICAL MYSTERY TOUR THIS MONTH, KIDS! DON'T FORGET TO BRING THOSE BABIES FOR BARBRECUIN', NOW, YA HEAR?! !